Plagiarism Checker X finds the free Plagiarism of your documents, articles, and web pages. Plagiarism detection with accuracy was not an easy job, but we made all the efforts to make things easier for you. Now you can check your essays, research work, assignments and written articles more quickly and accurately. 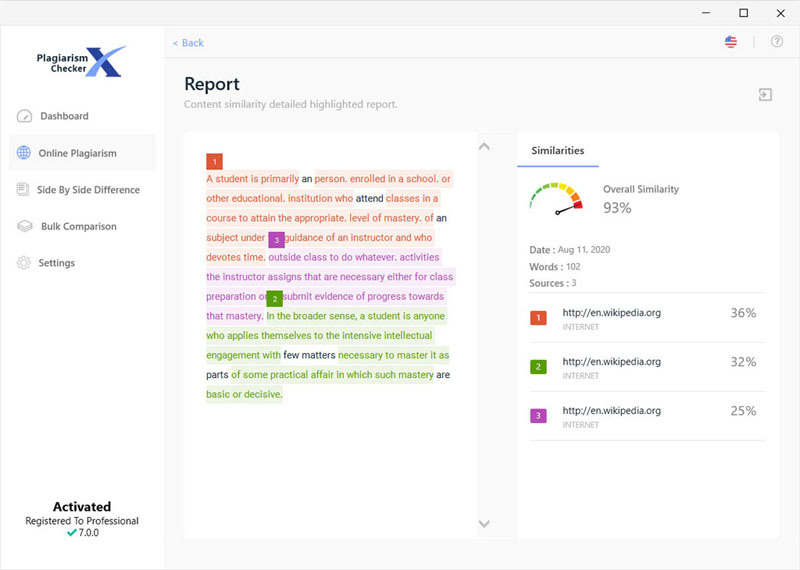 Using Plagiarism Checker X, one can quickly detect the web sources as well as the matched ratio with remarks and PDF reporting. Whether you are a student, a teacher, a blogger, or a website owner; Plagiarism Checker X can help you deal with all duplication concerns. It is a handy tool created to help you search and locate similar or identical content inside text documents and web pages. Browsing through 16 billion indexed pages in Google and Bing, it brings a detailed PDF report within a matter of seconds. The reporting format in itself is a significant advantage for the viewers as it classifies different percentage of similarity with a different color. Some people seem to be concerned about the privacy and security of their documents and assignments. It is to inform them that Plagiarism Checker X does not require you to upload your content; instead, you operate this tool right from desktop and nothing is stored online. It provides online checking, cross comparison, bulk search, and keyword searching facility to multiple segments of the market. Check the plagiarism free and detect all the originality issues within the content. This tools also support crosscheck feature for multiple documents or even the websites. Normally, teachers and online publishers/editors have documents in groups and checking them takes a lot of time. Such people can make use of bulk search option and scan the entire group with one click. Search engine optimizers can cross check two documents relative to each other. For writers and blogger, Plagiarism Checker X is a blessing as they can check content quality, be it published or yet to go live. Simply paste URL of the published work into the pane and receive results. A best free alternative to Turnitin and Copyscape.